Welcome to the 1st beer of our brand new series! The 759 series is a showcase of New England IPAs featuring different hops and alcohol % in each brew. First up we have 7, a deceivingly easy drinking 7 per cent brew. True to style it has a restrained bitterness that lets the hop juices flow. With a hop line up of Motueka, Nelson Sauvin and Azacca you can expect a big fruity burst of flavour. Orange and tangerine flavours are balanced beautifully with peach and mango and followed up with hints of pine and white grape. With a soft mouthfeel and hazy golden appearance this ticks all the boxes to kick off our new series in style. 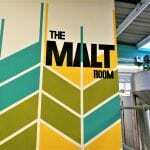 Malt: Maris Otter, Wheat, Lager, Oat malt, Dextrine. Hops: Simcoe, Motueka, Azacca, Nelson sauvin.